Coffee is a native of Ethiopia but is today cultivated throughout the world. South and Central America, and Africa are the areas of greatest commercial importance. It is a small tree or shrub, in nature up to 10 feet (3m) high; in cultivation kept smaller to facilitate harvesting. It has opposite leaves. They are. short-stalked, shiny and leathery, oblong- ovate in shape. The lateral branches are somewhat arching. The pure white flowers are arranged in groups of 5 to 15 in the leaf axils of the. lateral branch. They exude a fragrant jasmine- like scent. The flowering time. is usually restricted to a few hours, during which time the shrub looks as if it is covered in snow. From the ovary develops a two-seeded berry, green at first and dark red when ripe. The ripening takes about 12 months indoors. 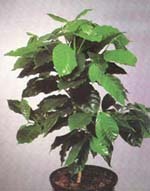 The coffee plant is an ideal houseplant for the east or west facing window. In good summers it can also stand outside in a warm sheltered space It will grow best, however, if planted in the greenhouse at temperatures of 67 F to 80 F (18-25 C). Whether in the window or the greenhouse, the plant, growing in nature in forests, shaded by trees, will require slight shading in. the summer months. It is happy with temperatures below 70 F (20 C) in winter, indeed they may go down to 60 F (15 C). A fairly high air humidity will be beneficial. mixture mixed with one quarter peat is best. It must be on the acidic side. To grow without set-backs, it needs an evenly moist soil ball. It must be kept drier in the lower winter temperatures. Rainwater or treated water is the best type that can be given, as. the coffee plant will not tolerate a lime content. crop of fruit, it is advisable to assist pollination with a soft- haired paint brush. The berry, each containing two seeds. (the coffee beans) will be ripe. after one year. They are then dark red in color. If you wish to harvest and then process the beans, remove them from the fruits., dry them and then roast over gentle heat in a frying pan with a little oil until they are dark brown. The plant is grown from seeds or cutting.. The same soil as that in which the mother plant is growing can be used for the seeds. They are planted flat about half inch (1.2 c.) deep and covered with soil. It will germinate after 5 to 6 weeks, and be patient. As soon as the second pair of leaves have formed after the cotyledons, the first transplanting into individual pots can take place. Invariably, every indoor garden enthusiast comes to yearn for more exotic plants. One of the most exotic, the banana is one of the simplest to grow indoors. Originally native to Southeast Asia, bananas are now found in most tropical and subtropical zones. It was the Roman Emperor Musa who first started exporting bananas after he tasted its delectable fruit, which is where the Latin name of the plant comes from. 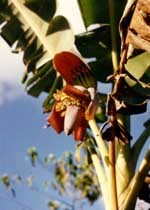 Bananas multiply by underground rhizomes, from which new stocks grow, each producing one flower cluster and fruit. The stalk can take 9-18 months to grow and another 4-8 months for the fruit to mature. Fertilizers rich in potassium speed up the fruiting. Suckers, continually being sent up from the base of the mother plant can be removed to start a new banana tree. After a stalk has fruited, allow one replacement sucker to grow because the main stalk will die after fruit has matured. Bananas are self-fruitful and do not need a pollinator. If you live in a tropical or subtropical climate banana species are in abundance and there are many to choose from. Most people who live in temperate zones acquire bulbs or seed from various mail order contacts. The most common banana grown for indoor use are ornamentals and the fruit they bear are pretty to look at but not palatable. Bananas seeds like most others prefer a warm moist area of growth, soil content must be porous, and well drained, (acidic growing mix with a pH between 5.5- 6.5) When seed sprouts allow itself to grow into its container before transplanting it. When you see several shoots make their appearance, apply into a deep and broader container Do not cover the corm, (the part where the stocks grow) entirely. The top 20 % of the corm remains exposed to the outer air until the new plant has grown into its production of several bigger fronds.